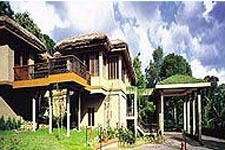 online hotel booking-The Taj Garden Retreat Hotel-thekkady-kerala. Kerala >> Thekkady >> Hotels >> Five-Star >> The Taj Garden Retreat Hotel . Hotel The Taj Garden Retreat Hotel. Local Languages English & Malyalam. Thekkady is a tiny hamlet on the periphery of the Periyar Wildlife Sanctuary, in Kerala. The Sanctuary allows visitors an opportunity to view elephants, wild boar, deer and other wild animals while cruising on the Periyar Lake. Visitors can also commune with nature by embarking on a jungle trek with a forest warden. Thekkady is the perfect place to get away from it all for a day or two. Taj Garden Retreat, this rustic resort is set in a three and half-acre estate of coffee, spices and fruit trees at the periphery of the Periyar Wildlife Sanctuary. The Taj Garden Retreat has 32 rooms in cottages built on stilts and surrounded by thick woods. The hotel comprises of 32 rustic, thatched roof villas located on the periphery of the famous Periyar Wildlife Sanctuary. This charming resort, 2,700 feet above sea level boasts of spacious rooms replete with fine wood décor and adorned by beautiful natural fabrics. The resort allows you to live in the midst of nature in absolute luxury. The Taj Garden Retreat offers 32 centrally air-conditioned rooms in cottages built on stilts to its guests for their comfortable stay in Thekkady. All rooms are elegantly appointed and have private balconies. Guest amenities include international direct dial facility, mini-bar, channel music, and color television with satellite programs. Taj Garden Retreat makes a preferred accommodation option for the business traveler too, in Thekaddy. There is one Meeting Room that can accommodate up to 40 persons in theatre-style seating.